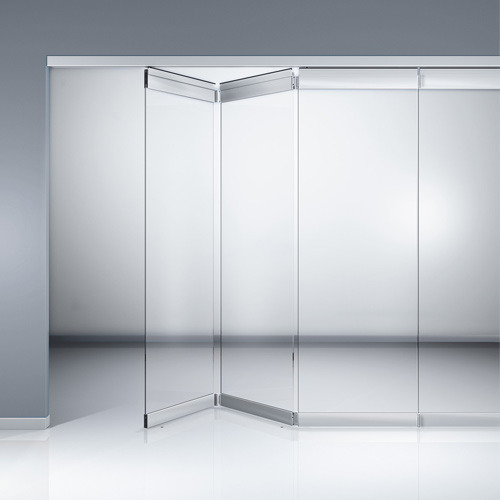 With their Folding Variant Sliding Glass Partition, we provides the ideal solution for linking or separating rooms according to your individual requirements. FSW folding sliding walls are the suitable alternative to HSW-G systems as they almost match in terms of their visual appearance and technology. Large spans can be implemented with the FSW-C and the number of panels per system can be freely selected between three and eight. Thanks to the central suspension point, pairing is not necessary. Double systems with two counter running assemblies can also be installed. Because the panels of an FSW system are visually compatible with the HSW-G panels, both system types can use the same track rail construction and can be effectively combined within a single frontage. Consequently, an FSW system can also be complemented by the addition of a free-standing HSW double-action or single-action end panel.